What sellers decide to list their property for is usually decided with the help of a realtor. Sometimes sellers have what we call in the industry "Sellers Equity" which means that the sellers feel like there home is worth more than what it is. Placer County's real estate market is currently favoring sellers. You could consider it a "Sellers Market" in a seller's market atmosphere it is crucial for you to have a CMA prepared for the property your interested in. This requires taking a close look at what other houses are selling for to judge the relative value of the home you are interested in. No matter how priceless a seller considers their remodeled kitchen or finished basement to be, the market sets a value—the price a buyer is willing to pay. 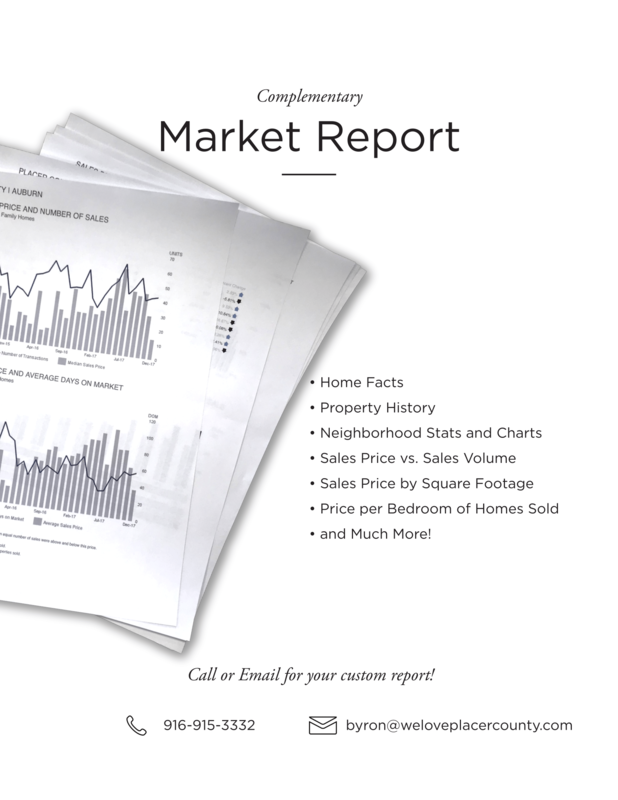 A comparative market analysis is a report, usually compiled by a real estate professional right before your house goes on the market or when considering what to offer. A CMA gives you information (sometimes referred to as “comps”) about houses similar to yours (in size, amenities, and location) that are either on the market, have sold, or were listed but expired (usually, because they were priced too high and no one bought) within a reasonably recent time period. It's ideal to have your CMA look back no more than three months when the market is in transition and no more than six months in a more stable market. - What their sale prices were in relation to their list prices (the difference between what people actually got for their house and what they asked for). For your free report, create a free account with weloveplacercounty.com and send us a quick message regarding the property you would like a report on. One of our Realtors will put together a complimentary report for you.